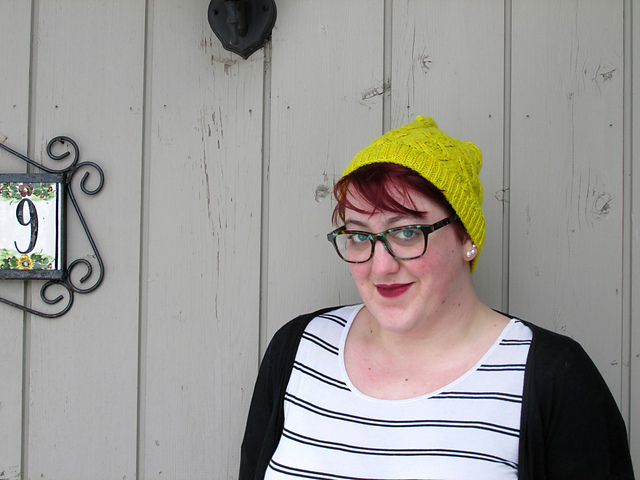 Meet Jeyna, a super warm, super soft, wide shawl with stripes and a ribbed border. I've been on a neutrals kick lately, so mine is knit in oatmeal and grey, but I might need to knit another one in more wild colors. Basic top-down construction includes spine increases on the right side and edge increases on every row, for a nice, wide wingspan. It's available for $5 on Ravelry now. I've been working on some other stuff, too. I finally got pictures of my finished Tubularity, and I have another project blocking that is either absolutely perfect or laughably messed-up. We'll see. For those of you interested in my progress on my vintage lace medallion shawl, I have 6/16 medallions done, and a buttload of knitting still ahead of me. Ooh, it looks so cozy! I love the proportions. And congratulations on starting the grad school process, that's huge! Beautiful! I'm such a sucker for stripey shawls.